Zombie Joe’s Underground Theatre Group presents Shakespeare’s beautiful and bloody journey of one man’s Machiavellian rise to power and ultimate descent into madness, terror and death, Richard III, directed by Denise Devin. 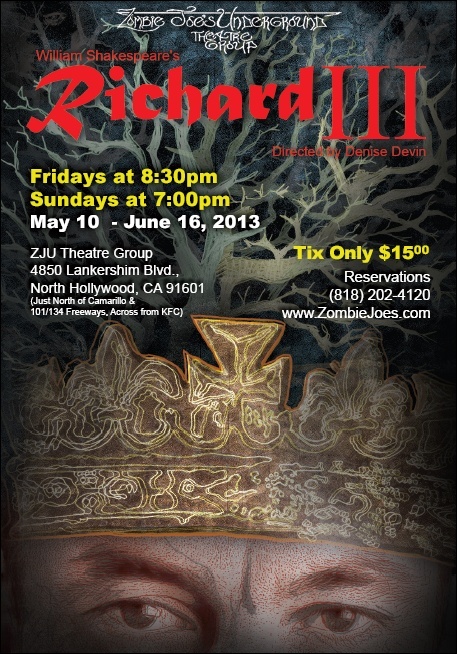 The show will run May 10 – June 16, Fridays at 8:30 pm and Sundays at 7:00 pm at ZJU Theatre Group, 4850 Lankershim Blvd., North Hollywood. Tickets are $15. For reservations call (818) 202-4120 and for more information, visit www.Zombiejoes.com.